A normal week day lunch for me is as follows: ½ cup of beans (either garbanzo, black, pinto, baked); dip chip carrots; banana. That’s it. Normal lunch. Well, on Tuesday I got treated to a non-normal lunch. And let me just say, it sure was tasty. My boss at work asked if I wanted to go to lunch and I, of course, said yes. We opted to go to Whole Foods which was just fine with me. After enjoying my lunch, I can say that I had a Wholly Good Time. Whole Foods is one of those places that is always busy. Any time of the day that you drive past the parking lot, there are cars there. Well, lunch time is even busier. Amongst the people doing regular grocery shopping, there are a ton of people stopping in to get lunch. This was my first time being there for lunch and I was shocked with all of the people. People were getting items in the pre-made food area, pizza, deli, and for us, the sushi bar. Rather than getting pre-made sushi, we opted for the sushi bar. Greeted by very kind staff, I was ready to begin this fun time. I have had the pre-made sushi before at Whole Foods but never sushi from the bar. The difference between pre-made sushi and sushi from the bar is like the difference between Goldstar and Skyline – night and day. 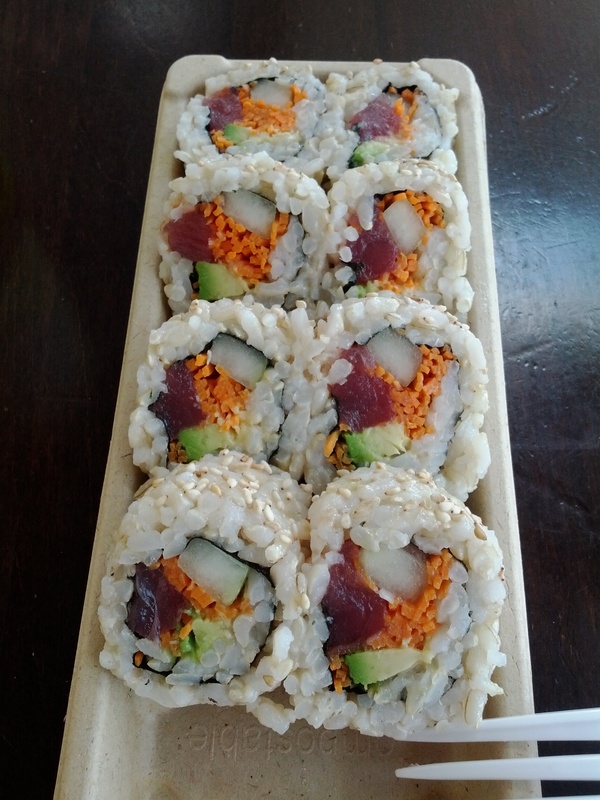 I opted for Brown Rice, Avocado, Carrots, Cucumber, Tuna and Sesame Seeds for my roll. Prepared right in front of us, we were presented with our sushi in a matter of minutes. And, I got this specially made roll for only $7.99. What a deal. I also got an Arnold Palmer and a Vegan Cookie…more on these items later. Let’s talk Sushi. We brought our items to one of Whole Foods tables to eat. When I opened this sushi, I found the pieces to be a good size and very full. I placed the first roll in my mouth and began to eat. The first thing that hit me was the freshness and consistency of the rice. It was so basic & simple in flavor yet produced the right flavor and consistency. The rice was sticky and had a somewhat nutty flavor. It wrapped the rolls perfectly and the amount used by my Sushi Chef was spot on. Even if the inside of the roll was bad (which it wasn’t) this rice would have salvaged the roll. The rice had a mismatched layer of sesame seeds as well which provided additional fresh flavor but, not too much crunch. The avocado inside of the roll didn’t have tons of flavor but, it had the moist consistency that complemented the sticky rice & interior beings of this roll. I really enjoyed the avocado even though the flavor wasn’t overwhelming. The carrots and cucumbers inside of the roll were very fresh and crunchy – the crunchiness also complemented the other aspects of this roll. All of the veggies used in this roll were quite lovely. As for the tuna in the roll, it was fresh and cut in nice little squares. The flavor was good but again, not overpowering. This is exactly how sushi should be – every single piece places its own part in creating an overall great tasting roll. While the flavors on their own may be subtle, the flavor when they are all combined is pure money. After finishing my great sushi, I moved onto my very first Vegan Cookie. Well, I am happy to report that it was just as tasty as a Non-Vegan Cookie. 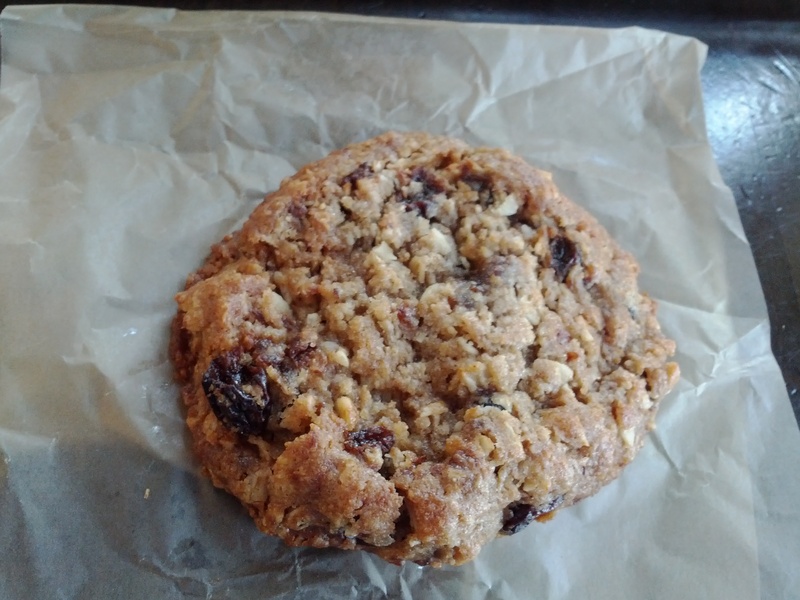 I had an Oatmeal Raisin Cookie and was impressed with the freshness of the ingredients. 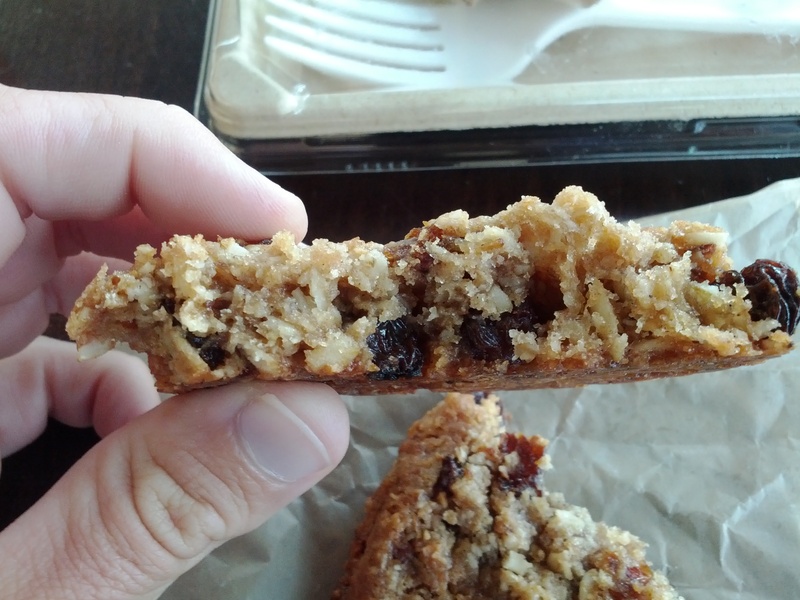 The raisins included were plump and juicy and paired well with the basic oatmeal and spices of the cookie. Every piece of the cookie was chewy, semi-dense and perfectly sweetened. If I had not known that this cookie was vegan, I would have never realized. Certainly good and one I would buy again. My first experience at Whole Foods for lunch was a great one. I washed my food down with an Arnold Palmer of a new brand I am not familiar with. And somehow, I forgot to take a photo of it – but it was good & tasty. 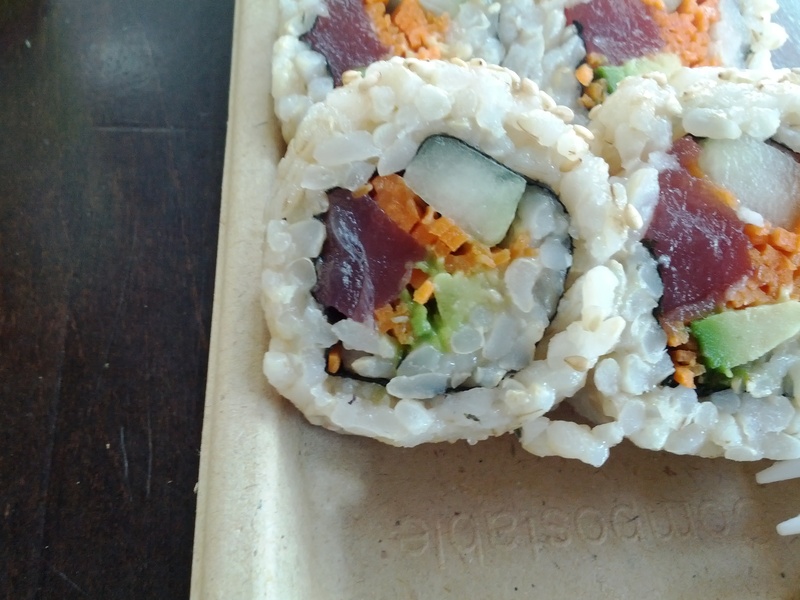 While I think that Whole Foods is normally beyond overpriced, I feel as if the $7.99 for the Sushi and $2.00 for the Cookie & Drink, are right on par. I was so excited about my lovely meal that I decided almost immediately that I would be back for more Sushi & Vegan Cookies. Glad I went – it was A Wholly Good Time.